It was better to arrive at the Lawton’s Hallowe’en party late, but you wouldn’t know that if you hadn’t been a regular guest over the years. The first hour or so of the party was always dedicated to taking the children around the streets to ask for trick or treat, and as the younger children of these middle-class people were naturally shy, the adults accompanying them mostly did the knocking, standing sheepishly behind the costumed infants as they held plastic buckets out to the people who answered the doors. A couple of adults were also delegated to follow at a discreet distance behind the older children, and it was easy to find yourself nominated for this job by some of the women, who were probably tired after working all day and had an eye on a glass of something and some non-work adult company; if you hadn’t got into the stride of a conversation (and if you arrived early you probably hadn’t), you were a perfect candidate for nomination. As celebrating Hallowe’en wasn’t really a custom in our country and had only been introduced in recent years through movies and television, the trick or treat could be awkward: at some houses you’d be greeted by treats, at others by embarrassed demurrals; or you would find yourself waiting uncomfortably on street corners with some other father you barely knew while the older children went boldly – perhaps too boldly – to knock on strangers’ doors. By arriving late you would have time to eat before you arrived: there was never enough food at the Lawtons’ Hallowe’en parties. Richard Lawton cooked piles of sausages on a barbecue in the tiny back courtyard, but the women fed them anxiously to the children to distract them from the trick or treat bounty, and the children ate them hungrily between handfuls of cheap sweets and chocolate. Later, when Celia Lawton reminded her husband, “I told you to get 10 kilos of sausages,” you could smile ruefully, but not hungrily, to yourself. When you arrived late the usual people would already be there, and would already have had enough to drink to have lost their middle-class reticence in social situations. They would be deep in conversations on which you could eavesdrop while you poured a drink and decided whether to join in or not. No one would notice when you didn’t. There was, of course, some discomfort in arriving late. A number of guests would be gathered in the street outside the house, rounding up children from the trick or treat, and you would have to sidle through them trying to look like you had been invited rather than someone who was wandering in off the street; you would have to thread your way through the narrow terrace house, past various groups of adults and children, looking for Richard or Celia Lawton to say hello and validate your presence; and when you found them, they would be in some animated conversation that you would have to interrupt. 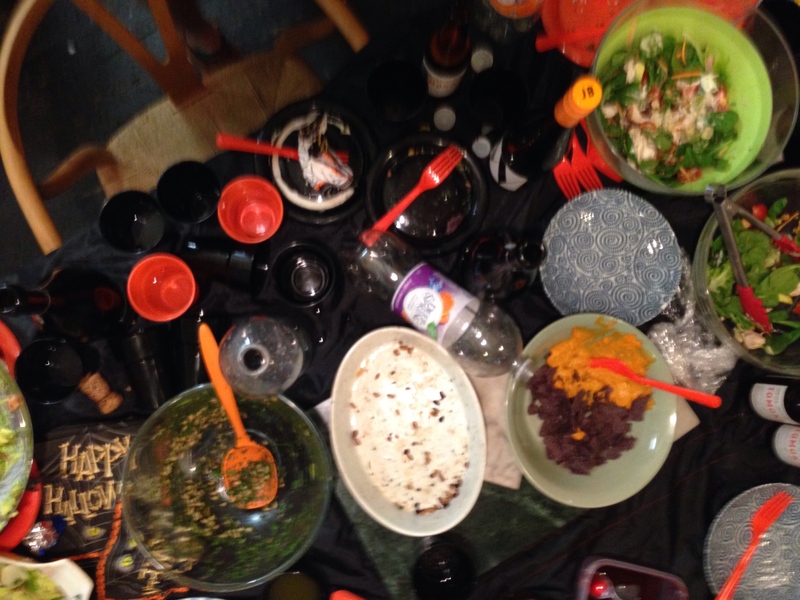 The party would have settled in the kitchen, and the table would be covered with empty beer bottles, used plastic cups and the scraps of whatever food remained. You would have to explain to Richard Lawton that you had left the beer you meant to bring on the table at home at the last moment, and he would open the fridge and hand you a bottle of some strange, floral-tasting craft ale, which was warm because they had already drank all the cold beer, and which he had bought because he found the label unusual. To open the bottle, he would direct you to a door jamb where he had mounted an old corner shop bottle opener, and you would fumble around trying to get the top off the beer (as you did every year); the cap, when it came off, would fall on the floor and roll away among the guests’ feet (as it did every year). At some point you would have to make it clear to a woman you were talking to that you also had children, but they were old enough to refuse to come to parties such as this: she would keep mentioning her children and husband, because she thought you were lonely, desperate and sad. But if you came late to the Lawton’s Hallowe’en party you would be there when everyone else had left. Then Celia Lawton would settle herself on a chair in the kitchen with her feet up on another chair and start to talk, and Richard Lawton could cut a few slices of something and find a bottle of good wine that another guest had left behind while you listened, and they would know that you had been to their Hallowe’en party, and would invite you back next year.